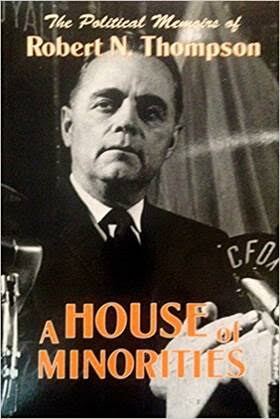 Robert Norman Thompson was part of a cross-partisan group of Canadian leaders that made a 1960s era “House of minorities” almost accidentally effective in its pursuit of far-reaching social and economic legislation. Indeed, many people, around the time of Canada’s 1967 Centennial referred to Thompson as “Mr. Canada”. Each of the leaders brought an unusual faith-based approach to his work, formed in part at least from their common backgrounds in evangelical Christian values coming out of Western and parts of Central Canada. The leaders who emerged in this “House of minorities” were Lester Pearson, Tommy Douglas, Robert Thompson, and John Diefenbaker. Pearson was prime minister in a four-year minority Liberal government and Douglas, the founding leader of the New Democrats (a left-leaning party formerly known as the Cooperative Commonwealth Federation). Thompson led the right-leaning Social Credit party whose roots were in Alberta and British Columbia. John Diefenbaker was minority prime minister, then official opposition leader to Pearson, during that period. Playing a contrasting role reflective of Quebec’s previous large influence in the federation was Real Caouette. He was deputy leader in Thompson’s Social Credit but, in the latter years of the “House of the minorities”, spun off its Quebec wing into the Creditistes. In a sense, Caouette’s was both a backward and forward thrust during those years – backward as a reflection of the glory years of French Catholic influence in federal politics and forward toward what became a post-Catholic move toward Quebec separatism. An enthusiasm for faith that led to the desire to communicate the “good news” beyond the community’s own culture, to the wider parts of the globe. A commitment to service and self-sacrifice that caused an increasing interest among such believers in contributing to the betterment of the larger community through, for example, public service and the shaping of public policy. A willingness to take the reading and study of the Bible seriously and, in many cases, literally, as a means of trying to understand the mind of God. An emphasis on personal initiative that led to a spiritualizing of the work ethic, a measure of free enterprise and a recognition of the importance, not only of church, but of family, in society’s fabric. Secondary, but not totally separated from these particular values, is the fact three of these four leaders came from the evangelical Bible-based ethos prevalent on the Prairies of Western Canada, and the fourth from a Methodist-rooted clergyman’s home where similar values were a part of everyday life. These values, were not, of course, limited to this form of Christianity. 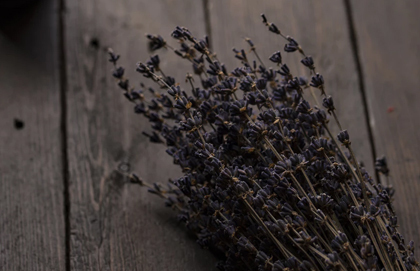 But they could be identified with the movement in starkly simplistic terms. And they made possible building a strong, if mostly invisible, coalition across partisan lines. Pearson was the person who came from a clergy home where the Methodist side of the United Church was readily recognized and practiced. And, although he himself did not “pledge the cloth,” Pearson wore his parents’ and his church’s emphases easily on his shoulders. His diplomatic experience prior to entering politics helped him to sense the balance between evangelical conviction and the impetus to serving the community in both domestic and global contexts. Diefenbaker was Baptist to the core – making the point during his legal and political career to keep ties to the Baptist World Alliance, the global denominational body that constituted a body of about 80 million people. Douglas was a Baptist minister, whose particular strand of denominational interest was the same as Diefenbaker. His early ministerial experiences in Depression-era Saskatchewan led him to embrace the social gospel and an accompanying vision of democratic socialism that brought him into some conflict with many of his faith compatriots. But he never lost his faith, choosing rather channel it into a championing of the “social gospel”: the idea that Jesus came to save not only individuals but society. Robert Norman Thompson was born in Duluth, Minnesota in 1914, into a family that taught him the dignity of manual labor, a respect for his Creator and the “reality of God’s love.” The family moved to Canada in 1918 and he attended school in Heckla, Alberta as a boy. After he graduated from Calgary Normal School, Thompson began teaching where he had attended as a lad, the Heckla Schoolhouse. As a student, he had read every book in the library of that one room country schoolhouse, but one book in particular, entitled Brave Men Choose, made a profound impact on his life. One of those "brave men," William Wilberforce, became a hero to him. Wilberforce, known for his advocacy of the ending of the British slave trade was an evangelical Anglican who was a Member of Parliament in England. Out of his faith perspective, he conducted a 40-year campaign against the trade. His vision was realized in 1834, a year after his death. At the age of 20, Thompson became interested in politics through the influence of William (Bible Bill) Aberhart, who, in 1935, became the first Social Credit premier of Alberta. Thompson’s own entry into that election, as a potential member of the legislature for Red Deer, was derailed because he was just a few days short of his 21st birthday. The next years kept him busy as a Socred (Social Credit) organizer and candidate. In the late 30s, he returned to school, graduating in 1939 from the Palmer Chiropractic College in Davenport, Iowa. Shortly after, he married fellow chiropractor, Hazel Monroe Kurth. They established a practice later that year, but the pull toward the Christian ministry, encouraged by his Lutheran then-pastor, and politics, kept the couple trying to look ahead. Then came World War II, and Ethiopia. Enlisting in the 15th Alberta Light Horse regiment with the rank of Lance Corporal, he soon transferred to the Commonwealth Air Training Scheme and was commissioned as a Pilot Officer in the Royal Canadian Air Force (RCAF). That led to a fortuitous friendship with Padre Gerald Gregson, senior chaplain of the RCAF, who had come to know Ethiopian Emperor Haile Selassie while the latter was in exile in Britain, after the Fascist occupation of his country in 1936. On the emperor’s return to Ethiopia, Gregson connected him with Thompson, persuaded that he might be an ideal person to help Selassie rebuild the devastated nation. That began close to a decade in Ethiopia for the Thompsons and their growing family (eventually there were eight children, four of them with some form of health challenge). During that period, Thompson worked with both the government and the Sudan Interior Mission, rebuilding the education system, establishing agricultural projects and helping set up a post-war Ethiopian constitution. One Thompson agricultural project, resulted in the proliferation of millions of Rhode Island Red chickens throughout Ethiopia, resulting in him being dubbed "Abba Dhoro"... "Father of the Chickens." The Emperor, himself a devout Christian and head of the Orthodox Ethiopian Coptic Church, quickly bonded with Thompson and gave him freedom to tackle the priority tasks. Thompson became a confidant and mentor to the royal family. They, too, granted him a title: "Fikurab," meaning the "Father of Love." In due course, that bonding helped build a unique political and spiritual relationship between Thompson and Lester Pearson, then a young diplomat and later Canadian prime minister. Pearson had gotten to know Selassie during his own pre-war years as a United Nations diplomat. Later, as Prime Minister and Socred leader, the two men consulted on both domestic and African issues, with Pearson occasionally assigning Thompson to such places as Nigeria to sort out diplomatic tensions. In 1952, the Thompsons returned to North America, where he completed Master of Education studies through the University of British Columbia, and Bob Jones University in South Carolina. Over the next several years, he and his family gradually moved back to Canada. By1960, he was ready for the next step in his leadership timeline. With the encouragement of Ernest Manning, then Alberta’s Socred Premier and National Bible Hour speaker, he ran for the leadership of the national Social Credit party. That role had just been vacated by Solon Low, himself a serious adherent to the Church of Jesus Christ Latter Day Saints (Mormon), which had a strong presence in southern Alberta. At age 47, Thompson won the leadership and immediately appointed his main competitor, Caouette, as his deputy leader. The Canadian Press reported on the almost unknown new political leader thusly: “A dark-haired, sad-eyed man of medium height and sturdy build, he is a precise and forceful orator. He's a firm believer in free enterprise and strongly critical of what he describes as a drift of Canada towards a socialist state.” It was this belief that made him a balancing feature to the NDP’s Douglas, when the two worked as “wings” to keep the Pearson Liberal government “plane” flying on a productive and stable course. In the June, 1962 federal election, Thompson handily won the Red Deer seat. Diefenbaker, who had held a massive majority of 211 seats in the 1958 election, was reduced to a minority government. The 1962 standings were Conservatives, 111, Liberals, 100, Socreds, 30 and NDP 19. Thompson held the balance of power. The 1962 Cuban crisis and attendant decision on the part of the Diefenbaker government not to support American president John Kennedy resulted in Thompson and the Socreds exercising that balance. The government fell in February, 1963. In the April 18, 1963 election that followed, the Pearson Liberals formed a minority government with 129 seats. The Conservatives took 95 seats, while Social Credit won 24 and the New Democrats, 17. Now, the two smaller parties shared the balance of power. There is no period in the history of Canada's modern parliament when so much was accomplished in domestic affairs. Medicare was implemented, and even though it is accused by the extreme right wingers as being socialistic, the fact is that with medical costs as they are today, Canada's model is the best. Despite its current abuse, unemployment insurance was started. Canada Pension Plan, which is more stable than the American one, was also started. We passed the Bill to share the cost of post-secondary education with the provinces without interfering with the province's authority. And of course, our new Canadian flag. While it would have been much more satisfactory to have instigated this type of legislation as Prime Minister, it was still gratifying to have been a part of the effort. Thompson’s often low-profile international efforts, many instigated by Pearson’s respect for him and particularly for his Africa experience, reflected an additional arrow in his leadership quiver. With respect to Canada-United States relations, his cryptic reference to the Americans “being our best friends whether we like it or not,” often found entrance into the speeches of politicians on both sides of the border. 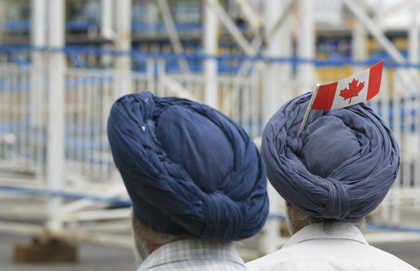 In Canada, it draws close to 1,000 attendees each year and is, in fact, sponsored by a group of parliamentarians that meets weekly and is made up of several faiths and political affiliations. Those small unheralded Thompson/Pearson prayer meetings in the prime minister’s office are, in effect, replicated today in these weekly, equally unpublicized, gatherings, sometimes involving up to 30 or more MPs and senators. When Thompson and his cohorts started, the annual draw was about 300. It might be argued that the breakfast serves to bring together Parliament Hill aficionados who wish to see and be seen. But the track record shows that the event raises awareness not only for the practice of prayer, but for attention to issues that relate faith to real life, whether in the realm of governance, education, business or family. Both Thompson and Pearson saw the former’s particular pre-politics experiences as being valuable in the international setting. In the approach to the 1967 Centennial, there came opportunity to give feet to that shared interest. In 1964 the Prime Minister met with Thompson to discuss Canada's responsibility for Third World development, especially considering the Centennial was only three years away. Together they concluded that Canada's Centennial festivities should include a program of international development, which resulted in the founding of the Centennial International Development Committee (CIDC). Once the Centennial passed, the CIDC became the Canadian International Development Agency, which continued its extensive public and non-governmental organization (NGO) co-operation for several more decades. In more recent years, CIDA was absorbed into the federal global affairs department. Many of the NGOs active in CIDA, from its beginning, have been faith-based. Under CIDC, non-government organizations throughout Canada as well as Canadians living in other parts of the world were invited to suggest international development programs that could be linked to Canada's Centennial Year. The Government offered to match dollar for dollar, funds that were expended on these projects. Over $2 million were given out by the External Aid in the Department of External Affairs to build Centennial monuments, libraries, water projects and museums. 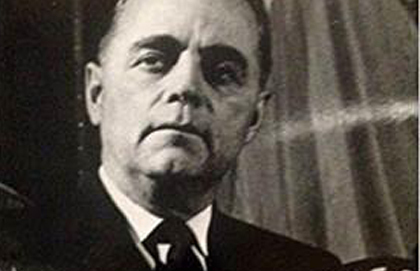 Meanwhile, the direct influence of the four leaders began to reshape in 1965, when Caouette hived off the Creditistes into a Quebec-rooted party. In that year’s election, the Western (Thompson) wing took five seats and Caouette’s group, nine. Thus, while Pearson engaged Thompson in the CIDC effort, things were changing in all the parties. Diefenbaker’s leadership of the Conservatives was challenged and the result was the election of Robert Stanfield, in 1967, to replace him. Pearson was openly considering retiring after the Centennial year. His party never gained majority status under his leadership, and Pierre Elliott Trudeau, then justice minister, was seen as being groomed to assume the Liberal leadership. Only Douglas seemed set to stay a few more years. He retired in 1970. After the 1968 election, Thompson became the PC national campaign director, in preparation for the next election, which occurred in 1972. He travelled the country, assisting Stanfield in the run up to that vote and resettled his family to the West Coast, deciding to run in the Surrey-White Rock riding there. He lost that vote to the NDP and the PCs, in effect, snatched defeat from the jaws of victory: When the dust settled, Trudeau’s Liberals took 109 seats, the PCs, 107. But Thompson’s faith-based approach to politics did not die in the dust. In subsequent years, following his example, many Western PCs who held to similar evangelical-leaning Christian values were elected to Parliament. Brian Mulroney, himself a moderately devout Catholic would later, during his tenure as prime minister, refer to these MPs appreciatively, if only slightly mischievously, as his “God squad.” Their faith imprint showed subtly by their “social conservative” approach. Social conservatives at that time were not so much identified as pro-life or pro-family, as they are today. Rather they were people who viewed seriously the social issues raised by the political left, choosing to use conservative means to develop policies in response to those concerns. Again, those impulses had come from Thompson’s years in the “House of minorities”, sharing with Douglas and Pearson in the development of what is known today as Medicare. The informal leader of the “God squad” was Jake Epp, a Manitoba Mennonite and Mulroney’s health minister. Later, after his retirement from parliament, Thompson quietly moved into the Reform Party of Canada column, providing personal encouragement to Preston Manning, the party’s founder and son of Ernest Manning – one of the people who had originally encouraged him to enter Canadian politics after his Ethiopian service. Once settled in BC, Thompson became active in the development of the fledgling Trinity Junior College (today known as Trinity Western University), founded by the Evangelical Free Church. He taught political science there, and served a stint as chair of the board of governors. He was also responsible for encouraging many young people from Ethiopia, including some members of Haile Selassie’s family, to get their education at Trinity. Some returned to leadership posts in their homeland and others are working in faith-based international development organizations in North America. Hazel Thompson died July 14, 1992. In 1993 Thompson married Evelyn Brant, a widow who, with her husband, had served in Ethiopia along with the Thompsons. Thompson died in 1997. Several speakers at his funeral identified him as a mentor to their own service. They included Donald Page, who developed the Master of Arts in Administrative Leadership (MAAL) at Trinity, Franklin Graham, son of Billy, who valued Thompson’s advice when he set up the international relief and development agency known as Samaritan’s Purse and Benno Friesen, an early Trinity professor who went on to serve as one of Mulroney’s “God squad” in the House of Commons. The Americans are our best friends, whether we like it or not. If your outgo is more than your income, then your upkeep will be your downfall. Next to the pulpit, there is no higher calling than politics. Common Sense for Canadians: McLelland and Stewart Ltd., Toronto, 1965. Canadians... It's Time You Knew! Aavengen Press, Ottawa, 1966. Liberation--The First to be Freed, Battleline Books, Vancouver, 1987. A Chrstian Voice From The Marketplace, Trinity Press, Langley, 1979. Canada Can Now Adopt a Model Constitution, (Co-authored with constitutional expert Cleon Skousen), Freeman Education Institute, 1982. A House of Minorities: The Political Memoirs of Robert N. Thompson, Welch Publishing Company, Burlington, 1990. Lloyd Mackey has close to half a century of experience in community, faith-based and leadership journalism, including 15 years working out of the Canadian Parliamentary Press Gallery in Ottawa. Books he has authored include These Evangelical Churches of Ours (Wood Lake Books, 1994), Like Father, Like Son: Ernest Manning and Preston Manning (ECW, 1997) More Faithful than We Think: Stories and Insights on Canadian Leaders Doing Politics Christianly (BayRidge Books, 2005) and The Pilgrimage of Stephen Harper/Stephen Harper: The Case for Collaborative Governance (ECW, 2005/2006). He is founding editor/director of the Online Encyclopedia of Canadian Christian Leaders, an outgrowth of his Doctor of Ministry (DMin) studies, completed in 2015 through Tyndale University College and Seminary. In 1984, he earned a Master’s in Business Administration (MBA) at Simon Fraser University. He and his wife, Edna, are trying to practice “active retirement” and an examination of “social architecture” in the emerging Central City urban core in Surrey, BC. Judi Johnston Vankevich, a Langley, BC, based author, speaker, ethics advisor, frequent consultant on matters of faith, politics, education and family issues, and Executive Director of Canadian Centre for Manners & Civility, holds a bachelor of arts in Business Administration and Political Science from Trinity Western University where she studied under Thompson when he was teaching political science there. Many of the facts of the Thompson stories and a number of quotes from him were drawn from her Regent University (Virginia) master of arts thesis. She maintains that “Dr. Bob’s common sense and godly leadership” inspired her thesis subject choice – Robert N.. Thompson: Christian Statesman in Canadian Politics” (available from Judi@Telus.net). For Dr. Sam Reimer, Professor of Sociology at Crandall University in New Brunswick, it isn’t hard to determine whether faith communities contribute to the flourishing of Canadian society. Rev. Marie-Louise Ternier, rector of All Saints Anglican and Redeemer Lutheran in Watrous Saskatchewan, reflects on the need to turn to church when tragedy shatters the world into a million pieces. 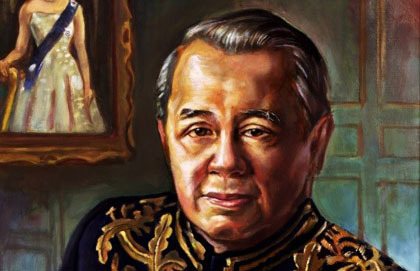 David See-Chai Lam, a Hong Kong-born businessman/philanthropist, served several years as British Columbia’s lieutenant-governor. A strong evangelical Baptist by faith, he also brought Confucian concepts of “harmony” into play in creative encouraging conflict resolution and management in business, public and religious life.